Corporate grade fax to emails for corporates companies and businesses. 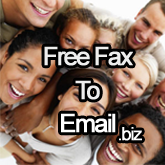 This service offer Fax to email services for corporates and businesses of highest standards. Allow files larger than 2MB through! This is one of the reasons for rejected faxes.